The original Declaration of Independence of Libertia. The history of Karnia-Ruthenia covers the history of Karnia-Ruthenia and its predecessor states, from the foundation of the Kingdom of Ruthenia to the present state. The name Ruthenia has been in use since November 2014 when it was a kingdom and from 2016 as an independent kingdom of the Empire due to the Karno-Ruthenian Compromise of 2016. Ruthenia was dominated by the House of Götzö-Thomaz-Rocha (or House of Ruthenia) since its foundation in 2014, then became the Karno-Ruthenian Empire as a dual monarchy with Karnia in 2016. The history of Ruthenia raises some questions. Should it be confined to the current Karnia-Ruthenia or to all lands formerly ruled by the rulers of the Empire, like the Principality of Lomellina? Of the lands now part of modern Empire, many were added over time, while other parts are now part of other micronations. The micronationalists who created the Empire began their careers micronational between 2009 and 2016. Besides the difference between the years they began their involvement with micronationalism, the influences of these micronationalists can also be observed in the current structure of Karnia-Ruthenia. The European micronationalists of the Empire were influenced by the micronational practices of the continent, closer to the definition of “aspirant states” like the Principality of Seborga, the Principality of Sealand and the Principality of Hutt River. 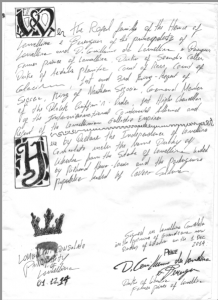 This kind of micronations are founded based on historical or legal anomalies (divergent interpretations of law). These types of micronations are usually located on small (or disputed) territorial enclaves, generate limited economic activity founded on tourism and philatelic and numismatic sales and are tolerated or ignored by the nations from which they claim to have seceded. Among the Americans micronationalists who helped the creation of the Empire, the micronational shed practiced was defined as political, social and economic simulations; even modelist projects, focused more on culture than for a micronational practice considered pure, resuming themselves in recreating the past or simulating political or social processes. Those micronational projects tended to be reasonably serious and they were largely inspired by micronations as the Holy Empire of Reunion and the Grand Duchy of Flandrensis, among others. To learn more about our history, read the article History of Karnia-Ruthenia from the Libertian Archives here.